Kim and Kourtney Kardashian leave fans fuming with their new Instagram post. Kardashians' recent post on Instagram garnered a ton of backlash from the fans and fellow celebrities. The Kardashian sisters are subjected to frequent controversies and backlash time and often. Apparently, their latest Instagram post promoting meal replacement shake further managed to infuriate and disappoint their fans. 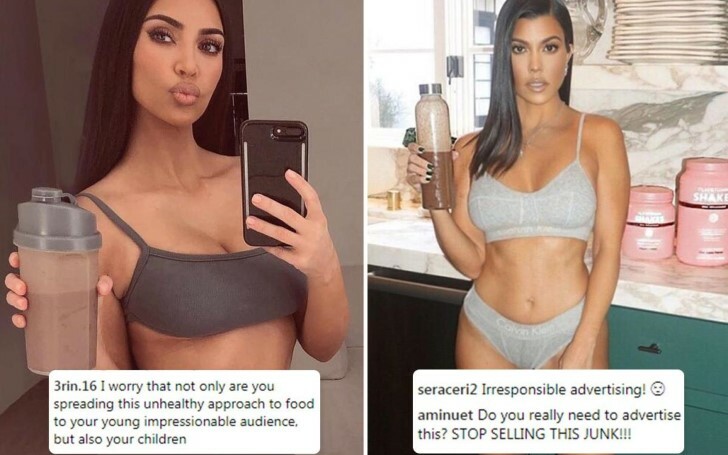 On Wednesday, Kim Kardashian and Kourtney Kardashian posted a picture showcasing their flat stomach on each of their Instagram accounts. At the first glance which looked like a usual selfie of the camera-obsessed stars was, in fact, the promotion of supposed meal replacing brand of shakes, Flat Tummy Co. Posing in activewear, holding the shake in one hand Kim Kardashian claimed she was taking the weight-loss product to give her a kick in the right direction after Christmas. But her fans weren't keen on trying the product instead it infuriated them earning her more than 17,000 negative remarks. The criticism, however, didn't deter the promotion. Furthermore, Kourtney Kardashian went ahead to post yet another similar photo with the product within an hour after Kim's post which also equally managed to garner harsh criticisms. #ad Back from Aspen and back on the @flattummyco meal replacement shakes...they’re exactly what I need right now. Day 3 on the program and I’m already feeling good again. I’m starting to see my tummy toning up nicely. Chocolate is my favorite, but they’ve got 20% OFF all their flavors right now so you guys should check them out! Recently, Kardashians are actively promoting the meal replacing shakes of Flat Tummy Co. 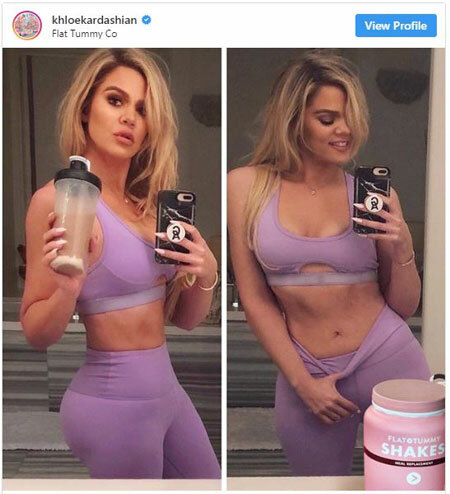 Similarly, Khloe Kardashian also promoted meal replacement shakes to her followers. As it came just days after claiming she didn’t want people to idolize her recent weight-loss her fans took it as a shock pointing out the inconsistencies in the 33-year-old’s message and argued that her 76 million followers deserve more from her. Along with the daughters, their mother Kris Kardashian was also spotted advertising the shake on her Instagram post earlier this week. Their posts outraged numerous fans who claim the posts are dishonest and misleading and can have the wrong impression on people who look up to them for inspiration. Moreover, one of the furious commentators also questioned whether they would give it to their children as a meal supplement. This isn't the first time the Kardashians faced backlash for promoting the brand's product. Earlier this year, Kim Kardashian was forced to delete a post advertising the brand’s appetite-suppressant lollipops after facing harsh criticisms from her fans and fellow celebrities. Jameela Jamil was among the stars who lashed out, with the presenter branding Kim “terrible and toxic”. Currently, The Good Place star Jameela Jamil is leading criticisms against celebrities promoting weight-loss products on social media.